This was my fave of the lot. 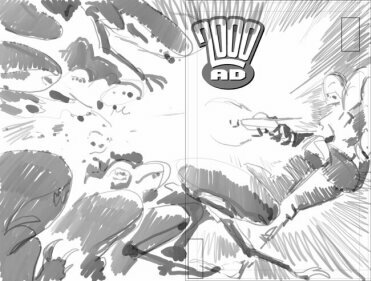 It had the idea of dredd reacting to something off panel which I liked cos it actually justified having a wraparound cover. Trick was to make sure there were at least SOME aliens on the front, but that the hordes weren't seen till the back was opened. Pretty loose sketch, like the others, drawn directly in photoshop. Luckily for me Tharg liked this one too. This was based on the page of henry's work which I was sent, and matt's suggestion that we see dredd shootin stuff on the front and behind him we see the aliens swarming in. 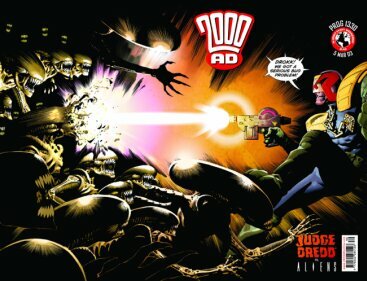 I wasn't too sure about this cos I wanted dredd facing the aliens but we had the problem that one of them would have to have their back to us. 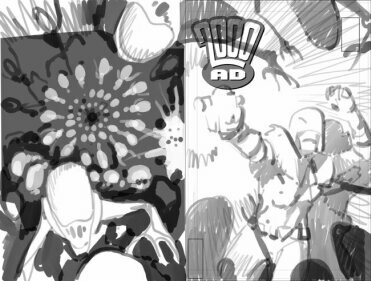 Here we have a very rough scribble showing the aliens on the reverse n dredd on d front. Not liked by me. This was my idea from the start. I had previously drawn a cover for dark horse for a series I worked on called "Fort! Prophet of the Unexplained" where the main character was seen shooting a swarm of unidentified beasties lurching towards him. 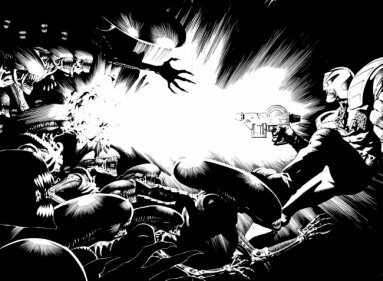 Not only did I like it as an image, I thought it would be kinda cool (as Dark Horse were gonna publish dredd-aliens too) to "homage" my own work. 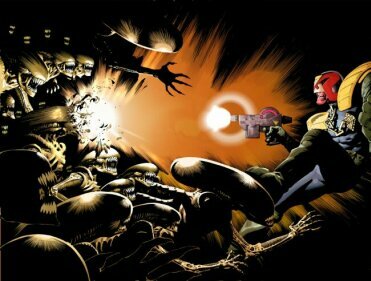 So here I replaced the Fort figure with dredd, and on the back I showed the viewer what he was shootin'. 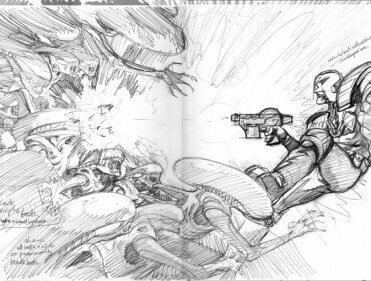 Didn't really work as a wraparound tho as the images were separate, and tharg felt the drama of the first sketch kinda had more impact than this one so it was dumped. Again, very rough scribbles in photoshop. The next stage was to paint in the colour. With this image I tried the same method I did with the Cabbalistics cover a while back, where I painted in the tones first as opposed to going straight to the final colour choices. This helps because it defines all the lighting and texture without confusing the issue with silly things like hue etc. here for some reason I did dredd in red and the bad guys in grey. Next, thanks to the magic of photoshop, I overlayed the basic colour areas on dredd and we start to see the whole thing happening. Still a lot to do, but the method seems to work ok. 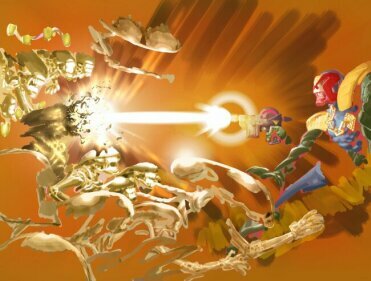 Here I experimented with some funky fx to create a decent gun shot for dredd. Until now the whole middle area had been blank, suggesting a shot rather than showing it, and I wanted something groovy for that. Some of this came about by accident but as is often the case it was a happy accident and I liked what had occurred. 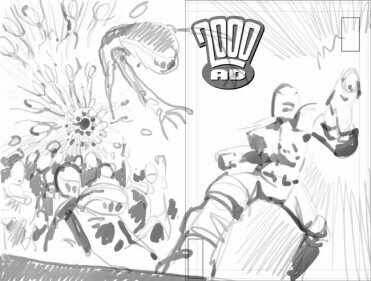 I applied a similar effect to the exploding alien head. The final version can be seen opposite (assuming Wake has done his job properly) and there u can see the additional tweaks to the background in terms of a little extra texture, some minor colour variations and some flares off the heads of the aliens. All in all an interesting cover (from my perspective) and one that I felt happy with.